This mini remodel was recently done in our apartment, within our house, where my mom lives. When we bought our house 3.5 years ago, we just used it as our second bathroom and we just cleaned it up and that was it. Then 2 years ago my mom moved into the apartment. She really wanted to update the bathroom, but we were in the middle of our Family Room Remodel and we didn’t have the money. (Family Room Remodel post will be coming up soon). So a few months my mom said she would pay for the paint & a new vanity and mirror. So we jumped at the chance. Thank you Mom!!! We appreciate it soooo much. 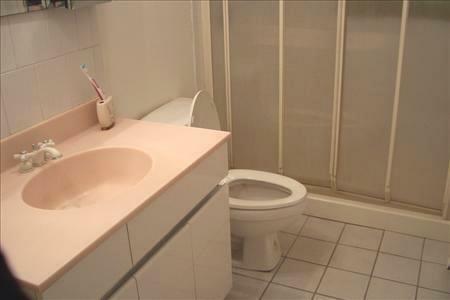 So this is what the bathroom looked like when we first looked at the house. See those ugly shower doors back there? 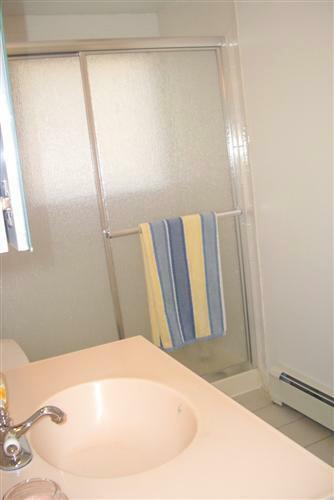 Yup those are bi-fold plastic shower doors. YUCK!!! Sorry I don’t have a closer picture of these doors. They were gross to say the least. Yes we bleached the heck out of this bathroom before we used it. Here is the oh so pretty vanity. Yes it’s Formica and yes it’s a light pink color. WOW. And yes that is a very dirty floor. This picture was taken once we bought the house. I believe it was right about when we closed on the house. Then we have our ever so pretty mirror. I felt like I was in Hollywood when I would looked in the mirror. Very weird looking mirror…..so it had to go. Bye-bye!!! Here is a better picture of the bi-fold shower doors. They were an off-white color and super dirty all over. They opened from the center, so you could get in. Very weird. Has anyone ever seen these before? I know we had never seen anything like this before. Clean bathroom now and new shower doors and new faucet for the sink. This is what the bathroom looks like now. My mom is a little Country, so this is everything she picked out. I think it’s cute. We painted the walls a light sage color. It really warmed up the space. The walls were just white before this. We replaced the vanity and the mirror also. Yes that is a shower curtain and yes the shower doors are still behind it. She likes shower curtains, but she knew were weren’t going to get rid of the shower doors since we just put them in 3.5 years ago. She can have the bathroom anyway she wants it this way. Here is a picture of the new mirror (medicine cabinet). Vanity and mirror were purchased at Lowe’s. Here is a close up of the vanity. It is a dark cherry wood color and the counter top is a off white. Here is the long wall that you see when you first walk into the bathroom. Those little pieces of art are little out houses. They are really cute. So here is the “Before”, “After” and the “Final”. “Before” & “After” of the Vanity. All work was done by me & my hubby. Thanks again Mom for helping us update our home.